You've got no weights, no gym, no resistance bands — but you do have the desire to work out. Luckily, you have a built-in system to allow you to do just that: your body. What's more, you can make a bodyweight routine super simple. Combine two of the lowest cost, lowest maintenance moves around — the squat and the push-up — to blast both your upper and lower body. Both exercises are infinitely changeable, so the beginner and the buff can make them challenging. Plus, you'll be right with the "in crowd." The American College of Sports Medicine listed bodyweight exercise as the top fitness trend for 2015. Don't settle for the mundane, either. Mix up the push-up and squat routine with circuits, timed sets and exercise variations to have a little fun. Dive in to change your physique! A circuit has you complete a series of exercises in quick succession to challenge your endurance and improve muscle tone. The American Council on Exercise describes it as a high-volume — meaning, lots of repetitions — and low-weight session. Squats and push-ups fit right in! When you add variety to the squats and push-ups, you emphasize different muscles, providing you with a comprehensive workout. In this routine, the triangle push-ups target your triceps, the Spiderman push-ups work your core and jump squats raise your heart rate. Do the following 10 push-up and squat variations for 1 minute each, back to back with no rest. Rest for a minute, then repeat the circuit one or two more times through for a complete workout. Warm up with 3 to 5 minutes of marching in place or stepping up and down. Standard Squats: Stand with your feet hip-distance apart, arms alongside your thighs. Bend your hips and knees to squat down. Reach your arms in front of you. Standard Push-Ups: Get into a plank position on your hands and toes. Bend your elbows to lower your chest to the floor and rise back up to straight elbows. Jump Squats: Sit down into a squat and explode up so that your feet leave the floor. Land back into the squat. Spiderman Push-Ups: Bend your elbows into a push-up and simultaneously pull your right knee in to your right tricep. Return the leg back to the floor as your rise up. Repeat with the other side. Plie Squats: Stand with your feet wider than your hips and toes turned out slightly. Bend your hips and knees to squat down. Rotational Push-Ups: Perform a standard push-up, but lift your right arm up and stack your hips and feet into a side plank. Return to a push-up and then lift your left arm and stack. Split Squats: Stand with your feet staggered, one about 3 feet in front of the other. Squat down by bending the knee and hip of the front leg. Your back heel will lift slightly as you lower down. Do 30 seconds with one leg forward, then switch. Decline Push-Ups: Place your feet on an elevated surface (coffee table, couch, stair step) and your hands on the floor. Push up and down with your upper body. Single Leg Squats: Stand with your feet hip-distance apart and lift your right leg straight up in front of you. Bend your left knee to go as low as you can and rise back up. Maintain your balance. Do 30 seconds before switching to the right. Triangle Push-Ups: Get into a push-up position, but place your hands so that the fingers form a triangle under your chest. Bend and extend your elbows. If you're short on time, do a variation on a pyramid workout. Each time you do the session, time yourself. See if you can beat your previous score. Start with one push-up and 10 squats. Without a break, immediately do two push-ups, then nine squats. Continue to increase the push-up number and decrease the squat number until you're at 10 push-ups and one squat. For an extra challenge, rest for 30 to 60 seconds and repeat the sequence a time or two more. Squats and push-ups are a gateway for new exercisers. Elemental movements combined with no equipment means you can do them anywhere. Approach the squat and push-up modestly if you're embarking on them from couch potato status. Start with just one or two sets of eight to 12 of each exercise. Rest a minute or so between the sets. Modify the push-ups on a wall or high counter or, alternatively, put your knees down in the floor as you press up and down. 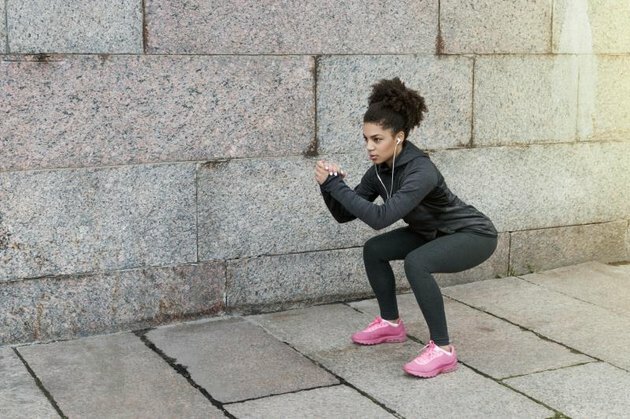 For the squat, bend your knees as low as you're comfortable going — with time, get your thighs parallel to the floor or slightly below. As you become more proficient, increase the number of repetitions and sets. After several weeks or months, you'll be ready to progress to the more challenging workouts detailed at the beginning of this article.